Filming in and around 8,000 sheep, directing first-time actors who also happen to be immediate family, and scrambling across badger-ravaged fields on dark December nights—it’s all part of the movie-making process for senior Film, Television, and Theatre student Javi Zubizarreta. Over the course of his undergraduate career at Notre Dame, Zubizarreta spent a great deal of time following sheep with his camera, most recently for his senior thesis project, Zuretzako (For You). The film illuminates the complex relationships between two generations of Basque sheepherders working in Idaho. Zubizarreta’s father and younger brother, who speak the Basque language in the movie, portray the two main characters. 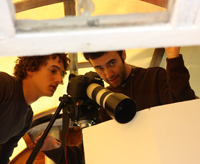 The project grew out of a documentary Zubizarreta made with fellow student Jacob Griswold during the fall of his junior year. 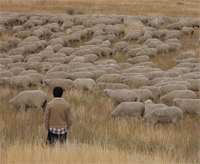 That film, Artzainak: Shepherds and Sheep, also illuminates the difficult lives of immigrant sheepherders in Idaho. Because of his family history, Zubizarreta says he particularly enjoyed making that film and getting a chance to show it to audiences around the world. Artzainak screened at film festivals in the United States, Ireland, Czech Republic, France, India, and New Zealand, and it was a finalist at a festival in Spain. The documentary, along with clips from other projects he completed while at Notre Dame, helped Zubizarreta win a prestigious 2010 Princess Grace Award. 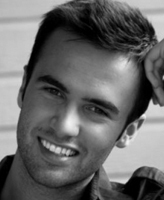 He was the only undergraduate among the six winners of the national filmmaker prize. Making a movie, says Zubizarreta, is both nerve-racking and wonderful. Ultimately, he says, “you have to be confident in yourself and what you did.” Part of Zubizarreta’s confidence arises from his training and experiences at Notre Dame. A commitment to writing has also been a key to Zubizarreta’s success, from publishing scholarly criticism in the journal Film Matters to getting a short story accepted by Lost Piece, Notre Dame’s undergraduate journal of letters. Zubizarreta’s senior thesis film debuts at the DeBartolo Performing Arts Center on May 6, and he hopes to arrange a premiere at Spain’s San Sebastian International Film Festival in September. “My career goal is to, within five years, make my first full, feature-length film,” says Zubizarreta. Meanwhile, he is applying for a Fulbright Scholarship to study scriptwriting in the Basque region of Spain next fall and plans to spend the summer in Los Angeles. Even a cursory glance at his accomplishments thus far is assurance that Zubizarreta stands on very solid ground. Originally published by Eileen Lynch at al.nd.edu on May 03, 2011.